Hi Lew – This is Susan Monaghan, and I corresponded with you back in May 2006. While surfing the web for additional info on LtGen William Gay Thrash, I read through your biography on him, and noticed you cited an e-mail from me as a reference for some info on LtGen Thrash. I would like to give you updated contact information for me and the VMD-154 website. You may recall that Thrash was assigned to this squadron as a Major in Oct 1942 and was stationed in the New Hebrides with VMD-154 through 1943. In 2008, my internet service provider changed, and I was unable to access and service my original squadron website. Subsequently, I have started a new website for VMD-154 and continue to add more information as time permits. The new homepage does contain a link to the original website; however, I plan to duplicate the pages from the old site and incorporate them on the new one. According to Mrs. W. B. (M. Louise Culpepper) Broach in a 27 Sep 1978 letter wrote: Bill Gay was a flyer in W. W. II. Was shot down and became prisoner of war for several years. According to Mrs. J. P. (Dorothy Gay) Poole in an 18 Nov 1978 letter, he is a retired General. Lieutenant General William G. Thrash, a Naval Aviator, retired from active duty, June 30, 1972. General Thrash earned a Silver Star Medal and a Legion of Merit during the Korean Conflict, and a Gold Star in lieu of a second Legion of Merit for exceptionally meritorious conduct as senior United Nations officer in a Chinese Communist prisoner of war camp. "For exceptionally meritorious conduct in the performance of outstanding service to the Government of the United States as senior United Nations officer in first and second companies, Prisoner of War Camp 2, Ping-chong-ni, North Korea, during the period 15 May 1952 to 1 September 1953. Although warned by the Chinese that any attempt on his part to exert his personal influence on other prisoners would be dealt with by disciplinary action and also being aware that the senior officer was under continually close surveillance, Lieutenant Colonel Thrash immediately took concrete steps to organize the prisoners on a military basis and to tighten discipline among them. "By his personal integrity, exemplary conduct, and wise leadership, he quickly won the respect and support of all the prisoners of various nationalities who comprised the camp's inmates. His actions were directly responsible for the good relations among all the prisoners, for the cohesive resistance to communist efforts to cause the defection of the individuals to the camp, and for the maintenance of military discipline in the camp. "As a result of his outstanding contributions as senior United Nations officer in the camp, he was placed in solitary confinement for a period of eight months and subjected to various types of maltreatment. Lieutenant Colonel Thrash's conduct throughout his long period of imprisonment gained the admiration and warm regard of the prisoners an was in keepinq with the highest traditions of the United States Naval Service." William Gay Thrash was born in Tifton, Ga., Sept. 17, 1916, the son of Jesse L. and Leila Gay Thrash. Graduating from Boys' High School in Atlanta, Ga., in 1934, he subsequently received his BS degree from Georgia School of Technology in 1939. During his senior year, he was a member of Georgia Tech's famed gridiron squad, the Yellow Jackets. Commissioned a second lieutenant in the Marine Corps on July 14, 1939, Second Lieutenant Thrash was assigned to the Basic School at the Philadelphia Navy Yard until June 1940, when he was transferred to Camp Elliott, Calif. He remained at Camp Elliott serving in various assignments as an engineering officer until transferred to the Naval Air Station, Pensacola, Fla., in September 1941 for flight training. Promoted to first lieutenant in January 1942, he received his wings as a Naval Aviator on March 18 of the same year. He was promoted to captain that May, then remained at Pensacola until September 1942 as an instructor. Captain Thrash joined the 1st Marine Aircraft Wing in October and went overseas with the Wing in November. While overseas, he was promoted to major in April 1943. During the period June to September 1943, he flew more than 100 combat reconnaissance missions over enemy territory in the Gilbert-Solomon islands area, earning the Distinguished Flying Cross and five Air Medals. Returning to the United States in January 1944, he was assigned to Marine Fleet Air, West Coast, until June 1945 when he was promoted to lieutenant colonel. Following another tour of overseas duty, where he saw service at Pearl Harbor, Saipan, and Okinawa, he was assigned to the Division of Aviation at Headquarters Marine Corps in January 1946. That October, he began a two-year assignment in the Office of the Chief of Naval Operations in Washington. In August 1948, he entered the Naval War College at Newport, R. I. Upon graduation from its logistics course in May 1949, he was assigned as an instructor in the Aviation Section, Marine Corps Schoota, Quantico, Va. Transferred to the 1st Marine Aircraft Wing in June 1951, Lieutenant Colonel Thrash earned the Silver Star Medal for gallantry in action, Oct. 25, 1951, as Tactical Officer and pilot of a plane in Marine Aircraft Group 12. Encountering 24 hostile jets while leading his flight of 11 Corsairs on a strike against a strategic enemy supply point, he led his flight in an aggressive attack, forcing the enemy planes to break off the engagement and retire. On reaching the target area, he succeeded in scoring direct hits, inflicting serious damage on the enemy. He was also awarded his first Legion of Merit with Combat "V" and his sixth and seventh Air Medals prior to being captured and imprisoned by the Chinese Communists in December 1951. Following his liberation in September 1953, he returned to the United States and was subsequently assigned as Executive Officer, and later, Commander of Marine Wing Service Group 37, 3d Marine Aircraft Wing, Miami. From May 1955 to July 1958, he was attached to the Division of Aviation, Headquarters Marine Corps, serving consecutively as Assistant Head, and Head, Plans and Readiness Branch, and Deputy Assistant Director of Aviation. While there, he was promoted to colonel in November 1955. In June 1959, he completed the National War College, Washington, D. C.
That July, Colonel Thrash reported to the Marine Corps Air Station, Kaneohe Bay, Hawaii, as Commanding Officer of Marine Aircraft Group 13. During this assiqnment, he led a trans-Pacific Flight of Marine light attack jet aircraft in a record-making first flight from Kaneohe, Hawaii, to Alameda, Calif. In August 1960, he was named Chief of Staff of the 1st Marine Brigade at Kaneohe. He served in this capacity until May 1962 when he was deployed to Thailand as Chief of Staff of the 3d Marine Expeditionary Unit. He returned from Thailand in August 1962 and assumed duty as Chief of Staff of the 1st Marine Aircraft Wing, Aircraft, FMF, Pacific, Iwakuni, Japan. The following June, he arrived in the United States, and assumed duty at Norfolk, Va., as Assistant Chief of Staff, G-3, Fleet Marine Force, Atlantic. In March 1964, he was promoted to brigadier general and assigned as Legislative Assistant to the Commandant of the Marine Corps, and was awarded the Navy Commendation Medal for service during this assignment. Following his promotion to major general, Jan 19, 1967 he assumed duties the following month, as Commander, Marine Corps Air Bases, Western Area/Commanding General, Marine Corps Air Station, E1 Toro, Calif and earned his third Legion of Merit. Major General Thrash was ordered to the Republic of Vietnam in July 1969, for a one year tour of duty as Commanding General, 1st Marine Aircraft Wing in the I Corps Tactical Zone, and earned the Distinguished Service Medal for his outstanding performance of duty during this tour. Upon his return to the United States in July 1970, he reported to the Marine Corps Base, Quantico, for duty as Deputy for Education/Director, Education Center, Marine Corps Development and Education Command. MajGen Thrash was nominated for promotion to three-star rank and his nomination was approved by President Nixon in February 1971. On March 12, 1971, it was confirmed by the Senate and he received his third star upon assignment as commanding General, Marine Corps Development and Education Command at Quantico. He served in the latter capacity until he retired from active duty, June 30, 1972. For exceptionally meritorious service during his last tour of duty while stationed at Quantico, he was awarded a Gold Star in lieu of a second Distinguished Service Medal. World War II Victory Medal; the Navy Occupation Service Medal with Asia clasp; the National Defense Service Medal with one bronze star; the Korean Service Medal with two bronze stars; the Vietnam Service Medal with one bronze star; the Korean Presidential Unit Citation; the United Nations Service Medal; and the Republic of Vietnam Campaign Medal. LtGen Thrash and his wife, the former Virginia Merryman of Atlanta, Ga., have two sons, William Gay Jr., and Ralph Merryman Thrash, both Marine Corps officers. LtGen and Mrs. Thrash will reside in Newport Beach, Calif. I saw your listing for Lt. Gen. William Gay Thrash on Ancestry.com and wanted to pass on some additional information. I am the webmaster for USMC aerial reconnaissance squadron, VMD-154. From1942-1943, William Gay Thrash was assigned to VMD-154 and was stationed on Espiritu Santo Island, New Hebrides (now Vanuatu). I would like to invite you to visit our website to read about the squadron, and there you will find photos and mention of Wm. G. Thrash on several pages (links listed below). Major Thrash is listed on Roster B of planes and crews which returned to the US. Maj. Thrash returned to the United States on a PB4Y-1 Liberator, plane # 31959. I don't have the date that this plane returned, however, might be able to get that from another crew member on the flight. I can tell you that my father was listed on roster A, and his plane (plane #31943) and crew departed Espiritu Santo on 16 Dec 1943 and arrived at Hammer Field in Fresno on 18 Dec 1943. Lt. Gen. Thrash's first wife, Virginia M. Thrash, b.17 Oct 1918, d. 21 Mar 1997, is buried in Beaufort Nat. Cem., SC. His current wife is Margie Wooton Guss Thrash. Hope this info is helpful to you. Feel free to contact me if you have any questions. E-mail written 27 May 2006 to Lew Griffin from Susan Monaghan, e-mail address. Photographed* say 1970� He was photographed say 1970 at Gay, Meriwether Co., Georgia. Biography* � Eleanor Culpepper Willingham wrote in a 13 Jul 1984 letter that "W. F. is in terminal stage of cancer. He had surgery about a year ago and continues to be hospitalized at intervals." According to the death notice that appeared in the Meriwether Vindicator , Friday, May 24, 1985, Mr. Gay was a Navy veteran of World War II. He was the mayor of Gay, a town which was named for his grandfather, William F. Gay and he served as the postmaster of Gay for 30 years. He was also the president of W.F. Gay & Co., and a farmer. The following article about the "Cotton Pickin' Fair," which Bill and Joann Gay founded, is from the Lagrange Daily News for Thursday, 12 Sep 1985: Fair To Honor Founder Gay The 23rd "Cotton Pickin' Fair" in Gay will be held Oct. 5-6, and will be dedicated to the memory of its co-founder, Bill Gay, who died last May. More than 300 exhibits will be at the fair, which attracted some 75,000 visitors last year. Antique dealers from as far away as Kentucky and as near as Warm Springs will occupy the barns and warehouses, along with a variety of food concession stands. The arts will range from oils, watercolors, acrylics to paper and fiber arts such as quilting, fine sewing, needlepoint, embroidery, doll making, as well as leather crafts, glass, copper and Pewter, basketry and all the decorative arts. Bill and Joann Gay founded the Cotton Pickin' Fair in 1972 to bolster the failing economy of the Gay area. Cotton was not only no longer King, it wasn't even the Jack of any trades anymore. Taking the old family cotton gin complex the couple turned it into an efficiently run fair twice a year, the first weekends in May and October. Not only did it help the exhibitors but the influx of tourists benefitted the entire surrounding counties and gave local non profit organizations an opportunity to make needed funds. To show their appreciation to Bill Gay, the exhibitors have contributed to a fund to raise a memorial stone on the grounds in his memory. This will be unveiled at 9:30 a.m. at the church service always held on the fairgrounds by the official fair chaplain, Kenneth Dobbs. Bill Gay died at the age of 57 on May 18 and was buried in the family cemetery on the grounds of Cotton Pickin' Fair. The following obituary, from an unknown, apparently a Columbus, GA source, was dated Monday, 26 May 1985: Ex-Mayor, Postmaster Of Gay, Dies Gay, Ga. -- William Franklin Gay II, 57, who founded the Cotton Pickin' Antique, Arts and Crafts Fair and was mayor and postmaster of Gay, died Saturday at Ormond Memorial Hospital in Ormond Beach, Fla., after a long illness. Mr. Gay, father of a Columbus man, had been vacationing in Ormond Beach. The funeral will he 2 p.m. today at Gay United Methodist Church, with burial in the Gay family Cemetery. Mr. Gay was born Oct. 3, 1927, in Gay, a son of Mr. and Mrs. Joseph R. Gay. 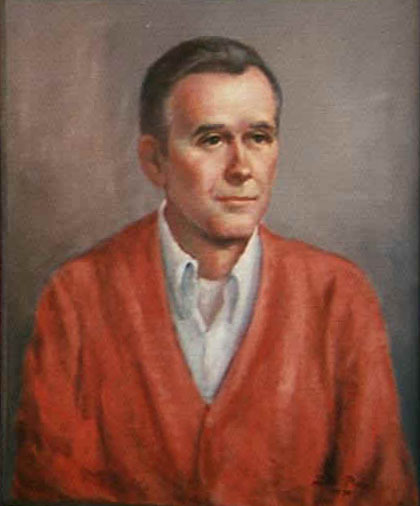 He attended Gay-Oakland School, graduated from Georgia Military High School in 1944, attended Georgia Tech and was a 1949 graduate of the University of Georgia. He was a Navy veteran of World War II. He was president of Alpha Tau Omega at the University of Georgia, vice president of the Interfraternity Council and Economic Society and a member of Alpha Kappa Psi commerce society. He majored in business administration. Returning to Gay, he worked for the family business, then called Gay and Keith Inc., and at the post office. He had been postmaster for 30 years and mayor for the past eight years in the town named for his grandfather, William F. Gay. He also was president of W. F. Gay & Co. and a farmer. He was a director of the Greenville Banking Co., a member of the board of directors of the Meriwether Historical Society, Meriwether Cattlemen's Association, Meriwether County Chamber of Commerce, West Central Georgia Tourism Association and Greenville Masonic Lodge 321. He was former chairman of the Greenville school board, the board of directors of Flint River Academy and the Meriwether Industrial Development Commission and a former president of the Flint River Academy PTA. He founded the Cotton Pickin' Fair in 1973 on the site of his father's cotton gin. He received the 1983 Meriwether County Chamber of Commerce Outstanding Community Service Award. He was a member, trustee and Sunday school teacher of Gay United Methodist Church. Survivors other than his wife, Joann, include a son, Joseph R. Gay II of Columbus; three daughters, Ellen McEwen of Lumberton, N.C., and Elizabeth W. Gay and A. Kathryn Gay, both of Atlanta; a sister, Mrs. Dorothy G. Poole of Atlanta; a granddaughter. In lieu of flowers, contributions may be made to Gay United Methodist Church, Gay, Ga. 30218.